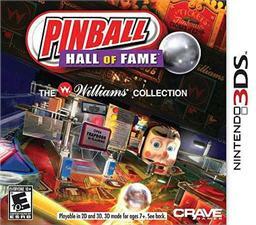 Pinball Hall of Fame: The Williams Collection offers a total of ten authentic tables from Williams' extensive catalog. Machines featured in the virtual collection include the industry's first talking pinball game, Gorgar (1979), as well as Black Knight (1980), Space Shuttle (1984), PinBot (1986), Taxi (1988), Whirlwind (1990), Funhouse (1990), Firepower (1980), Jive Time (1970), and Sorcerer (1980). Instead of making all tables accessible from the start, the game requires you to unlock all but four of the titles. To acquire the remaining tables, you'll have to complete various milestones, such as surpassing a high score or attaining a specific bonus multiplier. You'll also be able to unlock artwork, custom balls, free plays, and other bonuses as you progress.